Format contains "Limestone four horned altar. Height: 680mm; Diameter: 290mm; Width: 295mm." This altar was one of three limestone altars found in the vicinity of a storeroom in Megiddo. This one is carved from a single block of stone, has horns at the top four corners and tapers toward the bottom of the stand. It is partially discoloured by fire. These altars are usually interpreted as incense altars, because they are too small for animal sacrifice, although grains or other small offerings may also have been burnt on them. The horns may symbolize the divine, or indicate that the altars are imitations of architectural structures (towers), or they may have been intended to hold the bowl or vessel in which the offerings were burnt. Quite possibly they are a combination of all three. Altars such as these are predominantly known in the western ancient Near East, and are especially common in Israel and Judah between the eighth and fifth centuries BCE. They could have been used to make offerings to any deity, as incense and burnt offerings were part of everyday cultic activity. The Bible attests to incense being burnt to Yhwh (e.g. Exodus 30; Leviticus 16; 1 Kings 9), as well as to other gods (e.g. 1 Kings 11:8; Hosea 2:13). Both Zephaniah (1:4-5) and Jeremiah (19:13) attest that the people of Jerusalem were burning offerings, usually identified as incense, on the rooftops of their houses, and a small incense altar like the one above was found in a rooftop collapse at Ashkelon. Two incense altars have been found in Iron IIC contexts in the City of David excavations and can be seen in the Israel Museum. 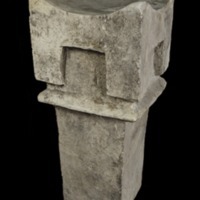 The small size of these altars and the fact that they are often found in domestic or industrial contexts suggests that they were part of popular religious practice, perhaps mirroring some of the rituals which took place in the larger temples. They are part of a wider architecture of ritual which includes the Altar from Tel Rehov, the Offering Stand from Jerusalem and the Musicians Cult Stand from Ashdod.